It’s been quite some time since I’ve posted a recipe and I sure miss it! Ever had one of these? It is believed they originated from New York. The original cookie calls for a thin layer of icing then half vanilla fondant and half chocolate fondant. 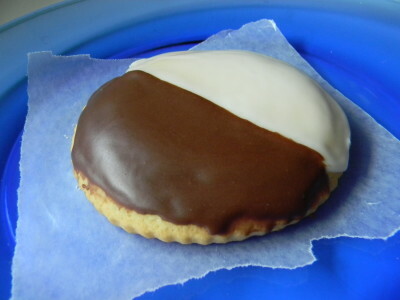 I am not particularly fond of fondant so I simply ice the cookie with half vanilla and half chocolate icing. I use my go to sugar cookie cut out recipe. Icing this cookie takes a little practice. I recommend making the vanilla icing first, icing half of the cookie, and letting it set up at room temperature, uncovered for at least an hour. You then add Hershey’s Cocoa to the vanilla icing with a little more milk and ice the other half. Be careful not to add too much liquid as the icing will ooze off the cookie. Allow it to set up for 3 or more hours. Then they’re good to go! 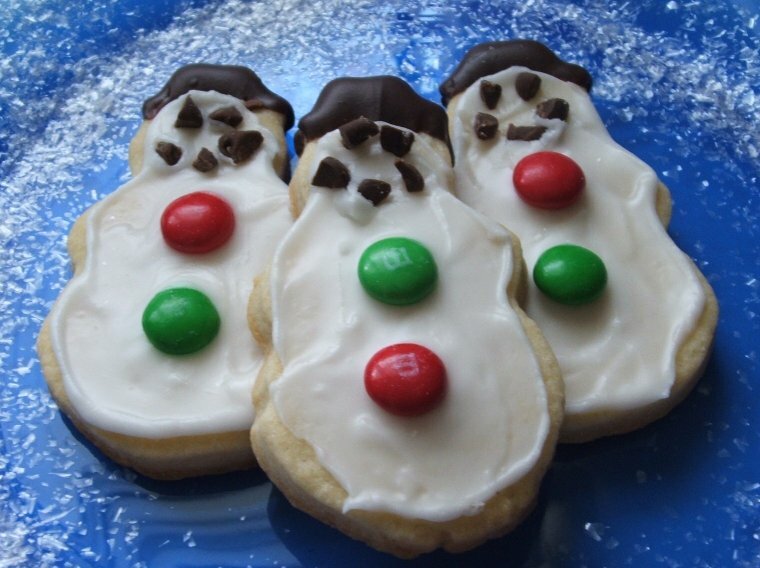 Iced cookies such as these do not freeze well. If you want to freeze them I suggest freezing them un-iced, then icing them upon thawing. This cookie recipe is large. If you’re not up to making 6 dozen cookies, freeze half of the dough. Wrap it tightly in plastic wrap, then into a freezer bag. Label and date. Use it within 3 months or so, the sooner the better. Thaw in the refrigerator for 24-48 hours before using. 1) In a large mixing bowl, beat butter until fluffy and add one half of the sugar, beat, then add the rest. Add two eggs and beat. Scrape down the side of the bowl. Add the remaining three eggs and vanilla, beat until nicely incorporated. 2) Lightly measure out flour into a separate mixing bowl. Add baking powder and salt, whisk until blended. 3) Add half of the flour mixture to the egg/butter mixture and beat well. Add remaining flour and blend until all ingredients are incorporated. 4) Shape into a large ball and wrap in plastic wrap, then put into a large zip bag. Refrigerate for an hour or overnight. It is easier to roll if you refrigerate it for the lesser amount of time. If it’s chilled overnight, let it sit at room temperature for 45 minutes or so to warm up a bit. 5) Preheat your oven to 375’ and line cookie sheets with parchment paper. Have cooling racks ready to receive hot cookies. 6) Cut off a chunk and begin working with your hands to make it pliable enough to roll out on a floured surface. Roll to 3/8” to 1/4″ thickness. 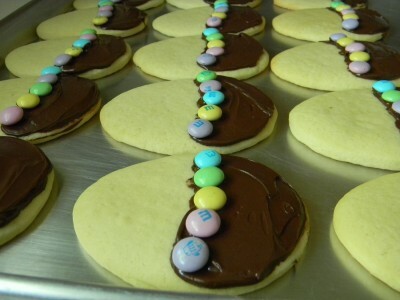 Cut into large circles and place on prepared sheets, leaving at least 1” of space between cookies. Bake for 10-12 minutes. Cool for five minutes before removing from cookie sheet onto a rack. Cool completely before icing. 1) Mix well, add more milk to make it spreadable but not so loose that it will run completely off the cookie. Ice 1/2 of the cookie, starting at the center with an icing spatula and continue to the edge. Again, this will take some practice. (They will taste incredible even if the frosting isn’t perfect!) Allow the cookies to sit for an hour or so to set up before you start with the chocolate half. 2) Add 2 tablespoons Hershey’s Cocoa to the bowl. Begin to mix, you may notice that more milk is needed. Add more milk a teaspoon at a time. The cocoa will give it an even better texture than the plain vanilla. Want it more chocolatey? Add more cocoa, 1 tablespoon at a time. Carefully ice the other half of the cookie, starting with the seam down the center then going to the outer edges. Need more icing? Add 1/2 cup powdered sugar to the bowl, a tablespoon cocoa and add enough milk to stir into a rich consistency again. It is best to let them sit out overnight to completely set up. Layer in a plastic container with parchment paper between layers. Enjoy within 2-3 days if they last that long! *Ice the whole cookie with chocolate and immediately add chocolate shavings. *Ice the whole cookie with vanilla icing and immediately add confetti sprinkles. *Add a little instant coffee to the chocolate icing and ice the whole cookie chocolate & top with chocolate covered coffee beans. *If you like orange and chocolate add a tablespoon or two of fresh orange zest to the white icing, YUM! I just love Valentine’s Day! It’s any chocolate lovers dream! Try my recipe for a basic cut out sugar cookie. (recipe below) It is key to refrigerate the dough before rolling out and cutting them out. Ice the cool cookies and then coat well with colored sugar while the icing is wet. 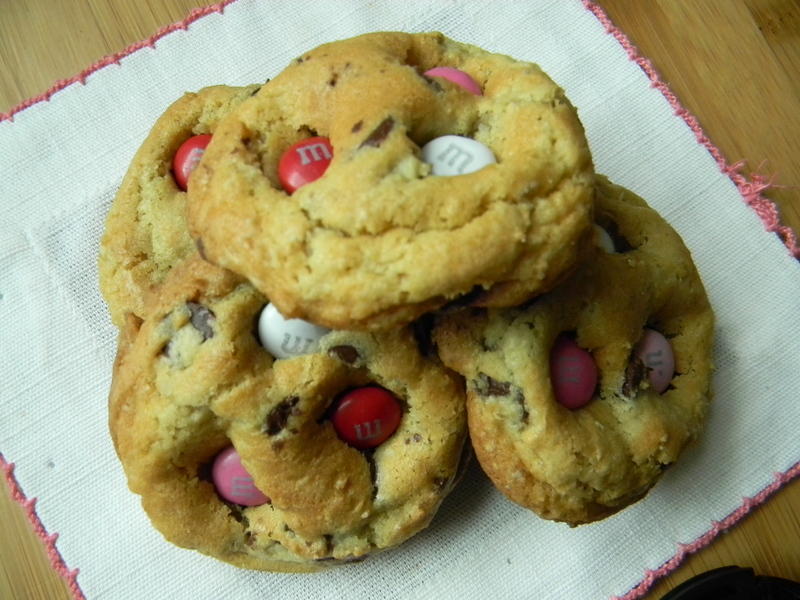 For chocolate chip cookies, press colored M&M’s into the tops for a festive looking cookie. 4) Shape into a large ball and wrap in plastic wrap, then put into a large zip bag. Refrigerate for a couple of hours or overnight. 5) When ready to bake, allow to sit at room temperature for 30 minutes. Preheat your oven to 375’ and line cookie sheets with parchment paper. Have cooling racks ready to receive hot cookies. 6) Cut off a chunk and begin working with your hands to make it pliable enough to roll out on a floured surface. Roll to 1/8” thickness. 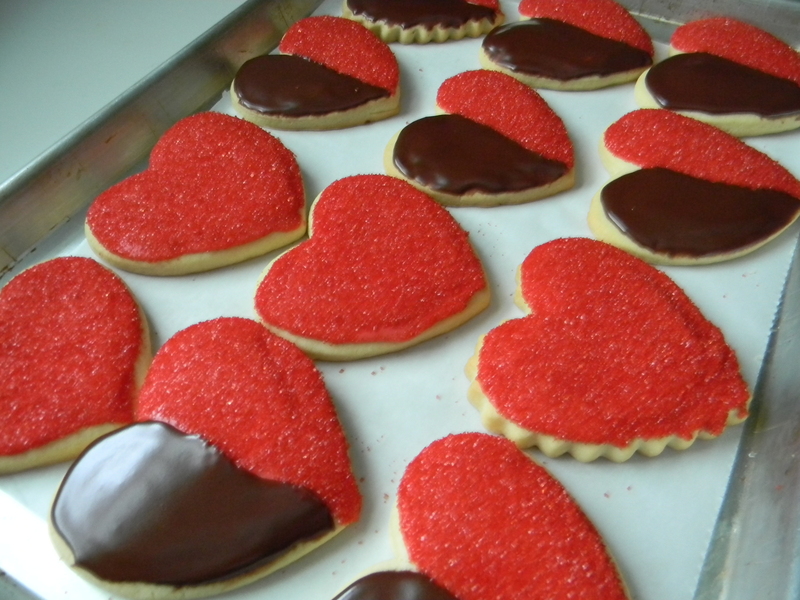 Cut out with your favorite shapes and place on prepared sheets, leaving at least 1” of space between cookies. Bake for 7-8 minutes. Cool for five minutes before removing from cookie sheet onto a rack. Cool completely before icing. Put the powdered sugar into a medium size bowl. Add liquid small amounts at a time and stir. 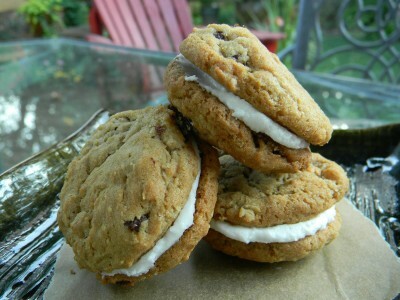 You will want the consistency to be thick enough that it will not run off the cookie but loose enough to easily spread. Don’t worry, if it isn’t perfect on the first cookie you can either add more liquid or more sugar to get the right consistency. 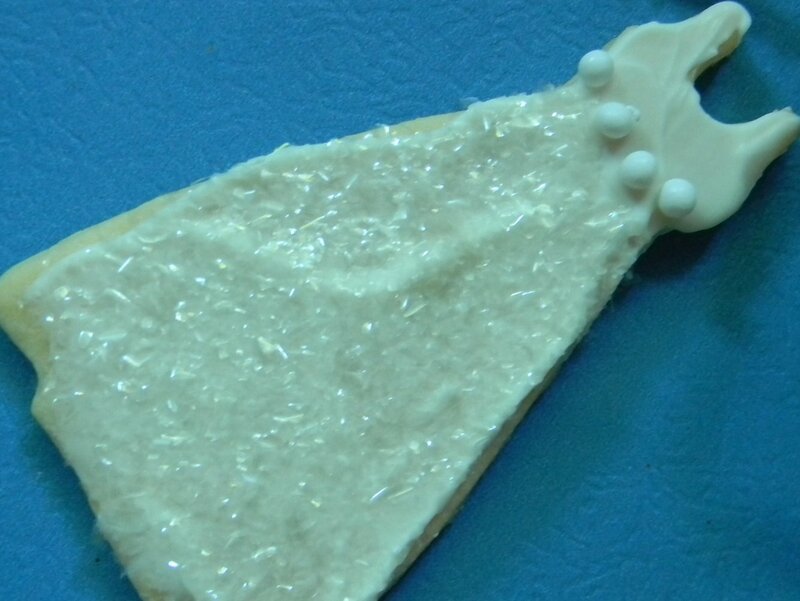 While the icing is wet, coat with colored sanding sugar. Allow them to set up for several hours uncovered. Big second graders. 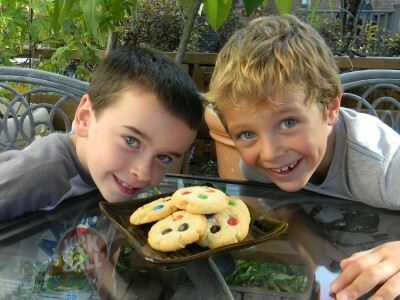 What could be more fun than a beautiful Friday afternoon after school enjoying a treat with one of your best buddies? Absolutely nothing! I asked the boys what they’d like for a snack and in perfect unison they said “cookies!” Fortunately I had a lump of cookie dough in my refrigerator! Always good to have on hand along with a bag of plain milk chocolate M & Ms. Anything with those bright little candies are better, right? They scream happy! In 15 minutes I baked off a couple of dozen World’s Best Sugar Cookies. I pressed M & Ms into the top of them right out of the oven. Wa-la, happy boys! I’m hoping to be the house the kids want to go to because there’s always good food! Wow, posting three days in a row! Feeling a little more settled and not so frazzled these days. 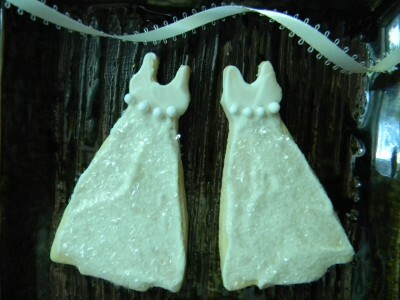 I’m finishing up a cookie order for a sweet table for a dear friend’s wedding. I made all of her favorites. Oatmeal Raisin Sandwich Cookies(pictured), Snickerdoodles, Raspberry Bars, Chocolate Chip with M & Ms the colors of her wedding, Peanut Butter Chocolate Chip Bars, and Iced Sugar Cookie Hearts, with icing the color of her wedding, of course! 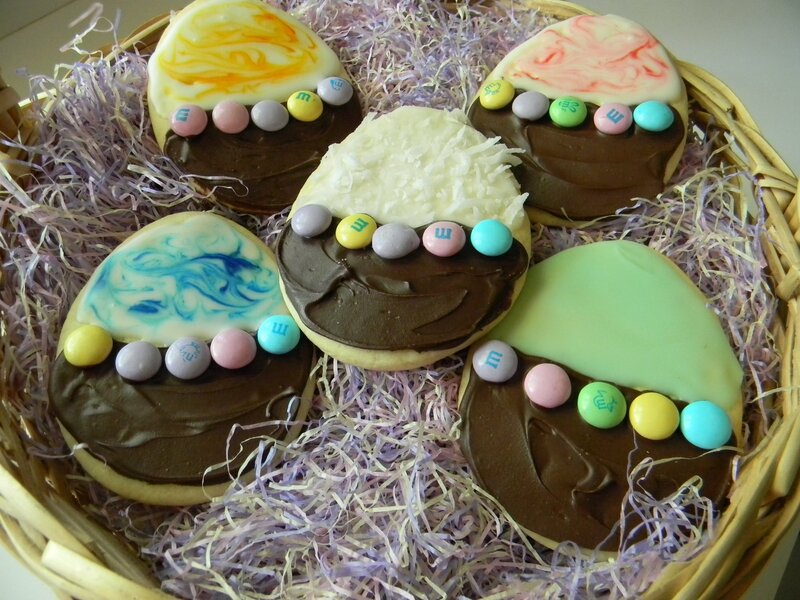 This cookie tastes as delicious as it looks. I use the smallest cookie scoop so that the cookies are uniform and don’t come out too large. Simply make my Oatmeal Raisin Cookies and the filling below. Add any ingredients to the cookies you like. They’d be delicious with walnuts and craisins or pecans, mini chocolate chips and raisins. The cookie recipe makes about 3 dozen large cookies. If using a small scoop, the recipe should yield about 5 dozen cookies or 2 1/2 dozen sandwich cookies. It is very rare that I use shortening or margarine in a recipe. It is needed to create the fluffy texture and will hold up nicely in the heat. In a stand mixer, beat the butter, margarine and shortening until well blended. Add the powdered sugar, vanilla and milk one tablespoon at a time while the mixer is on low. You may have to adjust the liquid depending on the humidity. It should be spreadable and fluffy. I love creating beautiful cookies. I found these bead like little balls on line awhile ago and had this flaky iridescent sugar on hand which I used for the bottom of the dress. I used melted white chocolate instead of icing which I applied like you would regular icing. I used a recipe that is more like a shortbread cookie. Basically butter, sugar, flour and eggs, no leavening to make the cookie rise. This is the best type of recipe to use because the cookie doesn’t rise and lose the crisp shape of the cookie cutter design. Anytime you want to decorate a cookie using white or dark chocolate, you’ll want to add the sugars and decorations before the chocolate sets up. Makes sense, right? Once it sets up the decorations are held firmly in place. This will make for easy packaging. Wrap them individually in cellophane bags and add a pretty ribbon. Lovely. I just love to decorate cookies. These are pretty and equally yummy. My cut out cookie recipe is very basic. I mix the dough the day before I plan to bake. This gives the dough plenty of time to chill in the refrigerator. Remember that the first batch you roll out is a little tough, after that, when you add the dough scraps to a fresh piece of dough, it gets easier to manage and roll out. Check out my cookie baking tips. When working with chocolate here’s what I do. I use semi-chocolate chips and melt in the microwave for 30 second intervals. Mix between each interval. Microwave the chocolate until the chocolate is smooth when you stir. Do not over heat, it will burn. Do not allow any moisture/water to get into the chocolate. Instead of dipping cookies into chocolate, I spread it with a spatula, like icing. The best thing about this is that it sets up beautifully and make them very easy to transport. Step 1: mix dough, chill over night. Step 3: melt chocolate chips and spread over cookie. Add any decorations into the melted chocolate. It will set up and keep decorations in place. Step4: once the chocolate is completely set, make simple icing and spread over cookie. Allow the cookies to sit out at room temperature for several hours or overnight. The icing will set and the cookies will package beautifully or go onto a tray without getting messed up. When making different colors, use small bowls for different colors. For the tie dye affect ice the cookie with white icing. With a toothpick, dip into another colored icing and simply swirl through the freshly iced white cookie. Very pretty. Have a blessed Easter weekend with your family and friends! I hope all of your Christmas shopping is coming together nicely. I’ve done most of mine on line, such a great way for me to shop! It’s been hard to post during this flurry of parties, baking, and..well, you know, we’re all busy. I had the lovelist surprise from my friend Genevieve. A warm loaf of Challah bread. Definitely a December highlight. First because she took the time to make something special for ME during this very busy time of year. Secondly, have you ever had a warm loaf of homemade Challah bread? If you have, you know what I’m talking about. Slightly sweet. Firm yet tender texture. A beautifully browned lovely crust. Pure heaven. Needless to say, my friend not only shared the warm Challah, but the recipe too!! Yippee!! Genevieve tells me she’s been making it for about ten years and she’s “tweeked” it over the years to her taste. The best recipes around are the ones we tailor to our own taste. This is going to be good. I’m going to make a homemade Challah, photograph it, and share it with you, compliments of Genevieve. This will become a regular in my rotation of baking, for sure. Planning on baking my brains out this weekend. In addition to the Challah bread, I’ll be making Raspberry Bars, Festive Peppermint Brownies, Peanutbutter Bars (with red and green M&M’s, Gingerbread Cookies, Pecan Squares, Coconut Macaronns, and Santa Thumbprints. These are sinful. Consider yourself warned. 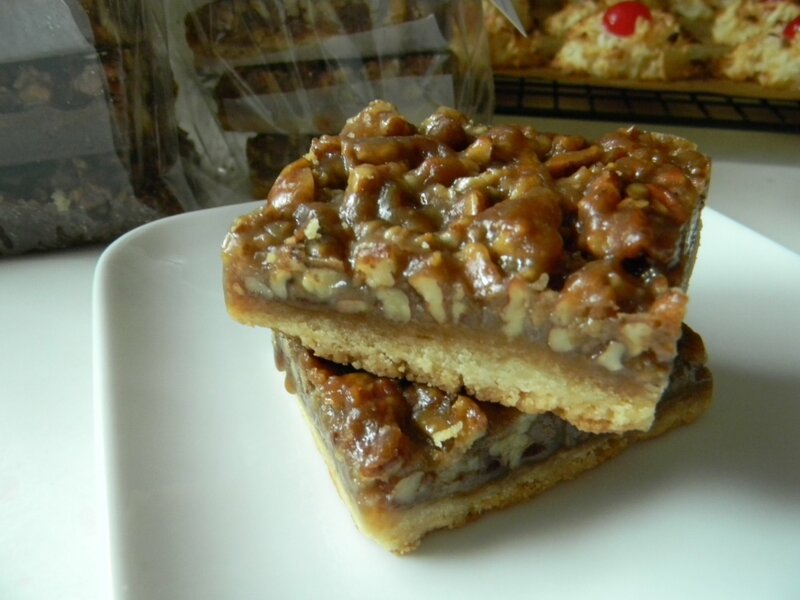 Think caramel, pecans, and butter crust. Truly amazing! The recipe calls for a 12″x18″ pan but you could make it in two 9″x13″ pans. They package beautifully. Layer with small squares of wax paper between pieces in the cellophane bags. Perfect gifts for teachers, the crossing guard, yourself! 1) Preheat oven to 350′. 2) For the crust, beat the butter and sugar together in a large mixing bowl. Add the eggs, vanilla, mix well. In a small bowl, mix the flour, baking powder, and salt together. Add to the butter/sugar mixture on low speed until just combined. 3) Press the dough evenly into an ungreased 12 x 18 x 1-inch baking sheet making an edge around the outside. If the dough is sticky, coat your hands with a little flour. Using a fork, poke holes all over the crust. (This will prevent large bubbles from forming under the crust while baking) Bake for 15 minutes. Cool. 4) For the topping, combine the butter, honey and brown sugar in a large, heavy saucepan. Cook over low heat until the butter is melted. Raise the heat to medium and bring to a boil for 3 minutes. Remove from heat. In this order, stir in the pecans, then the cream and vanilla. (when liquid is added to a boiling candy like mixture it can spatter) Pour over the prepared crust. Bake for 25 minutes. Cool completely. Store in refrigerator in air tight container. Makes 54- 2″ x 2″ pieces. This is the perfect time to start cookie baking. I find it much easier to mix one day, bake another, and decorate yet another. This is a good time to get started. 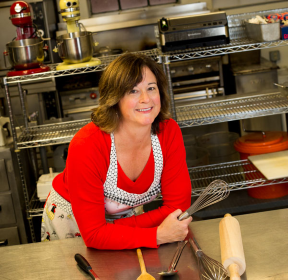 First check out my tips for holiday baking essentials. This is my equipment guide to successful cookie baking, easy clean up and efficient use of your time in the kitchen. Cookie dough will keep very nicely wrapped in cling wrap and into a zip storage bag. Label and date, as always, especially if you’re making a wide assortment of cookies. The dough will keep nicely for 2 weeks. I’ll be mixing gingerbread dough (aka “people cookies”) today. I’m thinking I’ll mix approximately 6 batches as they are the #1 cookie tradition in our house. My boys always look forward to these. FYI, after the gingergread cookie dough has completely chilled, it may seem quite unmanageable. Allow the dough to sit on the counter for 30 minutes before you begin. Cut off a chunk and really work it with your hands to make it pliable to roll out on your board. After you cut out the first batch, bring all the scraps together and add another chunk, working it together. It is very easy after the initial batch. Another lovely dough I like to use is a roll out butter cookie that has no levening. It is the perfect recipe for layered and filled cookies. Same deal here with rolling it out. Use the same recipe for darling snowmen cut outs. Mix your dough a day or two ahead then bake. If you’re not ready to decorate at this point simply freeze the cooki Pick a day closer to Christmas to actually decorate and put some aside for the kids to go crazy and decorate! There is plenty of finger licking going on here, so I put their personal creations into their own bag. I mix up my assortments as I do not like to decorate every cookie I make. Lovely bars such as raspberry bars, and festive peppermint brownies are perfect because they slice beautifully and make for a pretty presentation. My other Christmas cookie fav’s include santa thumbprints and chocolate dipped coconut macaroons. Beautiful and delicious! I’m so ready to get baking! 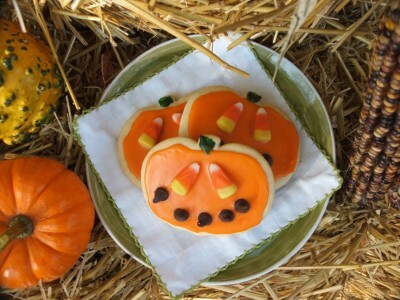 Every October the fellas in my house feel it necessary to repeatedly remind me that I need to make the “traditional Halloween iced pumpkin cookies.” It simply would not be Halloween without them. 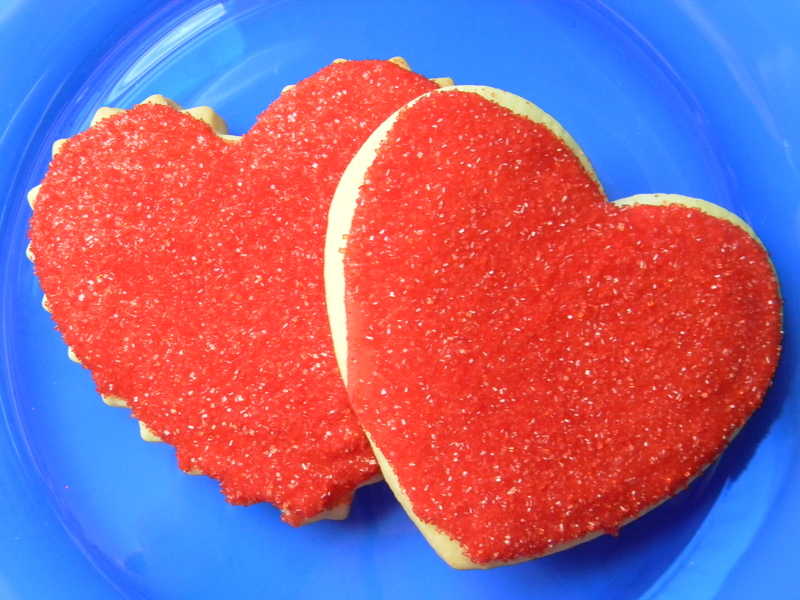 This basic sugar cookie cut out recipe is my go to for most any cut out and iced cookies. 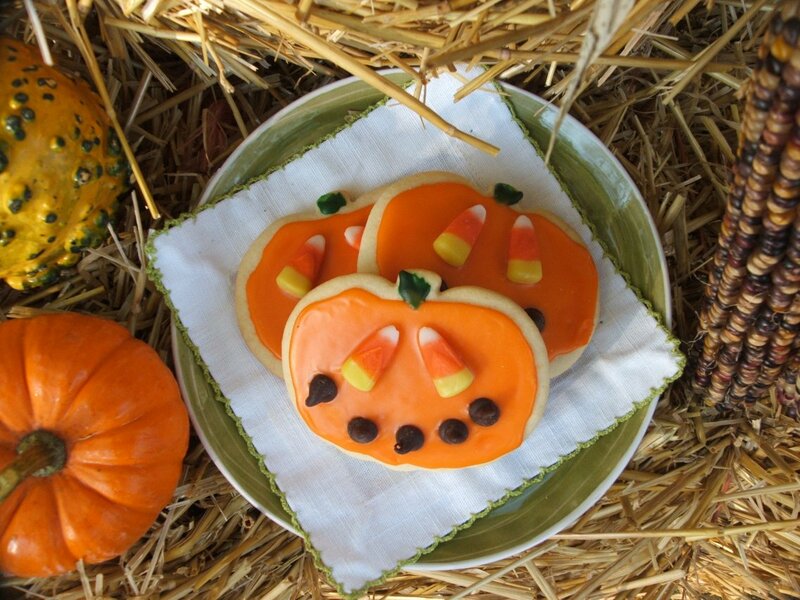 These pumpkin cut out cookies fit perfectly in gift cellophane bags, perfect for your favorite teacher! Ryan at this very moment my boy is prodding me to get in the kitchen and get the dough going…..gotta go! Ps-why not put a pot of Turkey Chili on the stove so you have something warm and hearty for Halloween night?? ?